If you have been on your office copier lease for a while then it may be time to consider if your office machine is still living up to expectations. Upgrading your copier can be a great way to reinvigorate your office if you have found yourself hitting a wall. Luckily, our staff at Fort Worth Copier is always there to help you know what to think about when upgrading your copier. Upgrading your copier doesn’t necessarily mean that you machine has gone bad in some way. 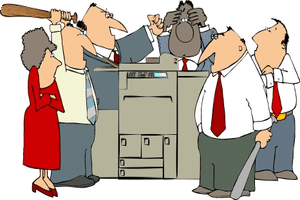 It is not uncommon for people to use their copiers for years without problems. However, they may start to experience growth in that same time, and their needs can easily change. This is the most common reason people upgrade their copiers. The best time to begin considering an upgrade is when you are nearing the end of your lease. This gives you time to address the issues you see in your own copier and start shopping for something new. It also gives you the option to look at other copier leasing companies to see if there are better deals. You can even use these deals to leverage your leasing company to get a better lease. You want to start thinking about where your business is going and what you are going to need. You don’t want to run into the same problem a few years down the road. Do you think your needs are going to change yet again, or have you hit your desired business goals? Upgrading your copier can be a great way to increase productivity and make your business move more smoothly than ever before. Give us a call to learn more about upgrading your copier today.